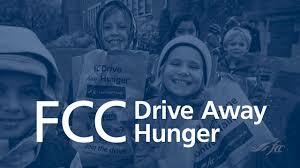 WES will be participating in the FCC Drive Away Hunger program again this year. Food donations are accepted in your child’s classroom from October 1st through October 12th. FCC will be at our school first thing in the morning of the 12th for pickup. Our total was 518 lbs of food and $6.00 cash for a grand total of providing 536 meals to the needy !! Thanks for participating in this worthwhile cause.